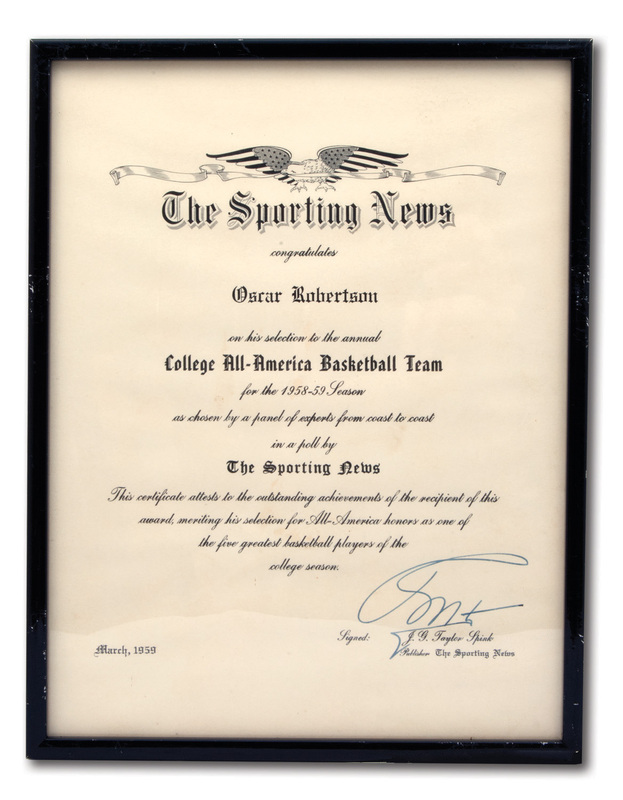 By Oscar Robertson’s junior year it was obvious he had the type of talent that came along once in a generation. In three varsity seasons with UC, “The Big O” single-handedly rewrote the Bearcats’ record book, led his team to a pair of Final Four appearances and put University of Cincinnati basketball on the map. At the end of the 1958-59 season, Robertson was named Consensus First Team All-America as well as College Basketball Player of the Year for the second of what would be three straight years. He was easily voted to the 1958-59 All-America First Team by The Sporting News. In recognition of this honor, Robertson was presented with this framed award. Dated "March, 1959" at the bottom and signed in blue ink by then-publisher J.G. 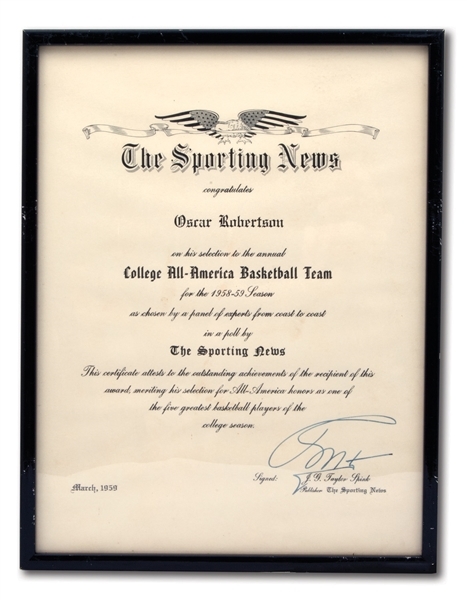 Taylor Spink (who inherited The Sporting News from his father Charles after brother Alfred founded the prestigious publication in 1886), the 8.5” by 11” sheet is emlazoned with "Oscar Robertson" and "College All-America Basketball Team" in Old English font. It has been perfectly preserved under glass in a black frame and comes just as Oscar displayed it in his home for decades. Includes LOA from Oscar Robertson.